PHOTO: Sample the Dream Mule, the New-Fashioned and the Lightbulb Martini at Virgin Atlantic Clubhouses. 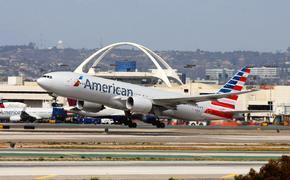 Virgin Atlantic Airways has always been one the most innovative airlines in the skies. Now it’s getting creative with its cocktails with three new concoctions set to be served in Virgin Atlantic Clubhouses, the airline’s lounges in the U.S. and England. 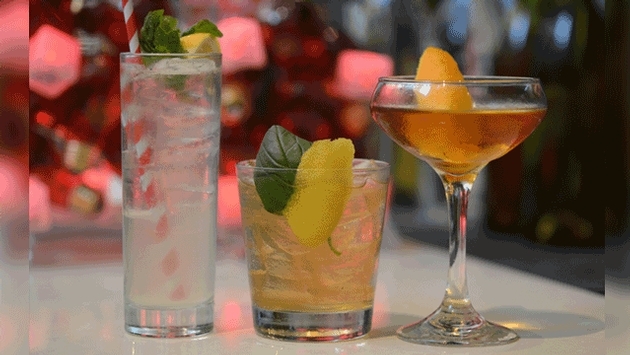 The three cocktails were specially designed by top mixologist Ryan Chetiyawardana, also known as Mr. Lyan, who developed them while flying on Virgin Atlantic’s Upper Class between London and New York. The new cocktail series, called “Creative Juices,” will be served in the Virgin Atlantic Clubhouses and two of the Morgan Hotel Group’s properties in New York and London beginning Aug. 1. PHOTO: Famed mixologist Ryan “Mr. 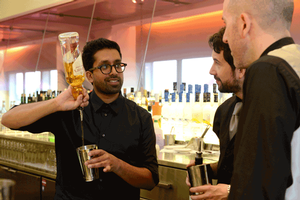 Lyan” Chetiyawardana gives a few pointers to Virgin Atlantic Clubhouse bartenders. Mark Murphy, Clubhouse food and beverage manager for Virgin Atlantic, says many of the airline’s customers arrive its Clubhouses early to relax and enjoy the service before boarding their flight. “Our expert mixologists will be recreating Mr. Lyan’s magic for our customers to try in our Clubhouses and in keeping with the way they were created, we’ll be serving the cocktails with ‘doodle napkins’ in the event of our customers experiencing their very own lightbulb moment,” he says. So just what do these cocktails include and how can you make them at home. Here’s how you can become your own creative mixologist and satisfy your friends’ tastes with the classiest and newest drinks in town. The Lightbulb Martini: Split one vanilla pod and store with jar of black olives. Combine 50 ml of gin or vodka with three dashes of orange bitters, 10 ml Martini Rosso vermouth and 10 ml of champagne. Stir over ice and strain into chilled martini glass. Garnish with an orange twist and then discard and add one vanilla olive. The New-Fashioned: Mix 50 ml of La Vida mezcal with 20 ml Angostura bitters. Dilute honey 1:1 with warm water. Combine 40 ml Dewar’s scotch whiskey, 10 ml Bacardi 8 rum, 10 ml honey water and three dashes of mescal bitters. Stir all briefly over ice and strain over fresh ice in a rocks glass. Garnish with a twist of lemon and basil leaf. The Dream Mule: Combine 40 ml of Bombay Sapphire and 10 ml of St. Germain liqueur with eight mint leaves and three basil leaves. Shake all of this briskly over ice. Double strain it over fresh ice in a highball glass and lengthen with the ginger beer. Garnish with a mint sprig and wedge of lemon. Got all that? Creative Juices will be available for a limited time starting Aug. 1 in Virgin Atlantic Clubhouses at New York JFK, Newark, San Francisco, Washington Dulles and London Heathrow. They will also be on the menu at the Hudson Hotel’s Henry H bar in New York and the Mondrian London, which opens on Sept. 30. The best thing about drinking these concoctions when you’re flying on Virgin Atlantic: You don’t have to drive home!